Bryan R. Forbes received his associate’s degree from Monroe Community College, where he was inducted into Phi Theta Kappa Honor society. He then received his bachelor’s degree in History and Criminal Justice from Canisius College. 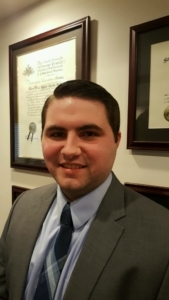 Mr. Forbes received his Juris Doctor from the University at Buffalo School of Law where his academic achievement was acknowledged, when he was awarded the ABA/BNA Award for Excellence in the Study of Labor and Employment Law. While attending Law School, Mr. Forbes served as the Justice of Phi Alpha Delta Law Fraternity. He is duly licensed and admitted to practice law in all of the Courts of the State of New York. Mr. Forbes began working for Baxter Smith & Shapiro as a law clerk while enrolled in Law School and has gained valuable experience both before and after admittance, working with matters ranging from insurance defense, municipal defense, insurance coverage, labor law, employment law, tenant-landlord, unemployment insurance and civil rights. He has also assisted in a number of appeals submitted to both the Fourth and Second Departments of the Appellate Division.